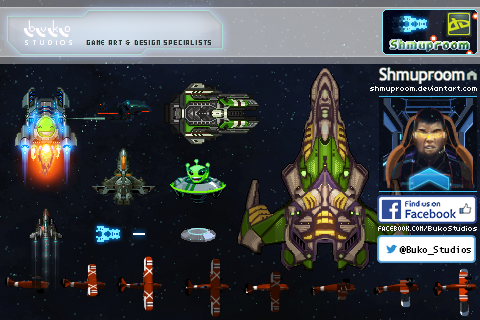 Shmuproom - Lots of Shmup related game art. Hey's all, first post here. If you will forgive the blatant promotion, I wanted to shout out about our group on Deviant Art, the Shmuproom. It contains a wide variety of artwork and media related to shmups. There is a variety of pixel art in there, and a few flash games. Feel free to pop in and check it out. Here are a few created by us..
Lots of great stuff on this forum, looking forward to joining in with this community!